Image from the Baltimore Orioles. The Orioles’ new program is attempting to strike a balance between short-term revenue and the long-term health of the game. Despite peddling nostalgic memories of fathers and sons attending games together, Major League Baseball has long struggled with how to attract young fans to the game and where to seat them. Teams have tried to sequester their youngest fans to the far reaches of the park so they would not bother paying fans. The location of the seats the Orioles are giving away to children fits squarely within that history. In the midst of the Great Depression MLB attendance declined and team officials worked to increase short-term revenue, but also aimed to secure their futures by hooking a new generation of fans on the game. American League owners sold half-priced bleacher-seat tickets to fans twelve and under, while maintaining league-mandated policies on dividing ticket revenue between the home and visiting teams and not discounting the most expensive seats in the park. There were limits on how much teams were willing to reduce prices for children though. American League owners limited the number of half-priced tickets to 1,000 per game so they would not lose too much revenue when games were more of a draw to full-priced ticket buyers. National League owners blocked a Philadelphia Phillies’ plan to sell discounted tickets to children because the Phillies’ plan did not include giving the visiting team its regular share of ticket revenue. Some owners, like Tom Yawkey of the Boston Red Sox, were concerned about the impact of large numbers of unsupervised children on fans who paid full price. Yawkey created a special section of the Fenway Park bleachers for children who bought half-priced tickets, separating them from the rest of his paying customers. Only selling half-priced tickets in the bleachers meant grandstand fans did not have to deal with rowdy or noisy children in their sections where the behavioral norm was supposed to be adult, refined, and a model for the rest of the park. Discounted tickets for children were not restricted to the Depression. In the 1950s, Major League Baseball and the Quaker Oats company gave away tickets in every box of Quaker Oats that allowed children twelve and under free admission to the ballpark, provided they were accompanied by a paying adult. Rather than cap the number of tickets per game, to ensure tickets to the most popular games were not given away for free, this program excluded Sunday, night, and playoff games. Owners hoped this program would get kids interested in baseball and get their parents to the game. Quaker Oats hoped it would increase sales of their products to kids who wanted free tickets. Being bothered by kids was an annoyance most fans did not want when they came to the ballpark, but if those children were accompanied by adults, it seems they were welcome. Effectively, the Quaker Oats ticket program broke down the separation between adults and unsupervised children. It forced adults to interact with children who did not behave like they did. In response, Weiss called for an end to the program. Weiss’ reaction suggests that while team officials were concerned about the future of their business, they were more worried about inconveniencing the fans they already had. Other teams also recognized that unsupervised children at the park might bother their adult fans and established “knot-hole gangs” in part to keep them away from paying fans. The St. Louis Cardinals set out a specific part of the left-field bleachers for their knot hole gang. If the Cardinals were going to let a large number of unsupervised children into games to entice them to become future paying fans, they had to ensure that the children would not negatively impact the experience of any of their paying fans. Segmenting them in the bleachers was one way to do this. In the 1960s, Walter O’Malley, the Los Angeles Dodgers owner, planned on having 300,000 children at the park admitted for free each year. To partially fulfill that promise, in 1964, the Dodgers offered 11 weekday-night games where they would let children and their chaperones in the park for free. A total of 3,000 fans would be allowed in one of the outfield pavilions, Dodger Stadium’s version of bleacher seats, completely filling it, and each adult was allowed to chaperone up to five children. Confining free tickets for kids to the outfield pavilion was a tried and true tactic for owners to avoid annoying their paying customers and one that strictly divided Dodger Stadium was perfectly suited for. Although the Orioles trademarked the slogan “the Ballpark That Forever Changed Baseball” to describe Camden Yards, they are employing a tactic that is as at least as old as the end of Babe Ruth’s playing career to bring young fans to the park. Much as teams did in the past, the Orioles are giving away tickets in the far reaches of the park that are unlikely to be sold and keeping a distance between kids let in for free and their highest-paying customers. While the logic of letting kids into the game for free to try to get them hooked on the sport (and to have their parents buy them dinner at concessions stands as well), seems pretty straightforward, there are some underlying inconsistencies. For example, are the upper reaches of a ballpark, now further from the field than they were at older ballparks, really the best place to hook new fans on the game? In their quest to attract young fans, the Orioles are pairing Kids Cheer Free with a host of other programs aimed at making sure kids have a good time at the park. They are going further than teams did in the past to ensure kids want to come back. For example, if kids get bored with the view from high above the playing field, or don’t have the attention span to sit for nine innings, their parents can take them to the “Kids’ Corner” which “features entertainment for younger fans, including a moon bounce, speed pitch, climb and play area, a batting cage, larger-than-life Oriole Bird bobbleheads and much more.” Kids’ corners did not exist at Fenway Park in the 1930s or Yankee Stadium in the 1950s. Additionally, after every Sunday Orioles home game, kids ages four to 14 can run the bases on the field and at all games the Oriole Bird mascot will entertain fans too. 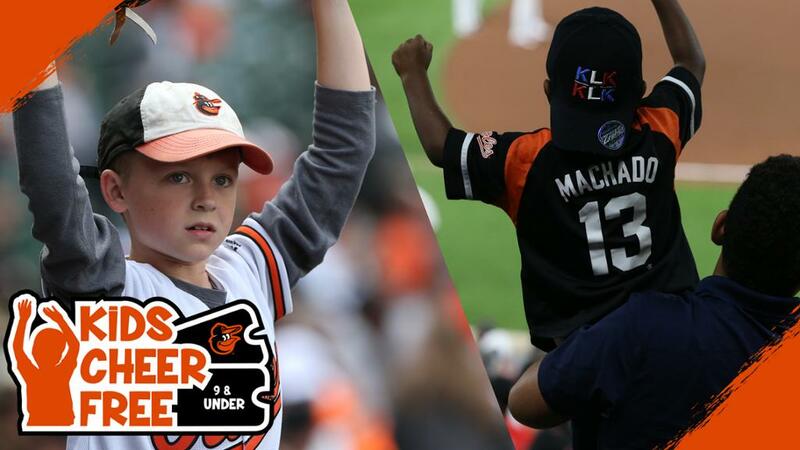 Young Orioles fans, who experience the game through the Kids Cheer Free program and take advantage of the Kids’ Corner, might very well have a good time and want to come back to the park. But one wonders if they will be conditioned to appreciate distractions from the game as much as they are the game itself. The upper deck does not provide the best vantage point to follow the game, making the distractions of the Kids’ Corner even more enticing to children with short attention spans. In order to keep young fans coming back to the park as adults and get them tuning into the game on TV, the Orioles will have to approximate an experience that is entertaining, but one in which the game on the field is secondary. If that pattern continues, perhaps the Orioles will be more in the business of selling a good time than of selling baseball. Seth S. Tannenbaum is a doctoral candidate in twentieth-century American history at Temple University. His dissertation is about the fan experience at Major League Baseball games in the twentieth century. You can follow him on twitter @SethSTannenbaum. Ballparks and Stadiums, AL-special admission of children 12-years and younger 1937-1955, Box 1, Folder 4, HoF. American League Papers, Series 3, Dan Daniel, “Box Top Ducat Setup Draws Weiss Blast,” Quaker Oats, Box 41, Folder, HoF. Ballparks and Stadiums, Quaker Oats joint proposal, free tickets for children 1954-1955, Box 1, Folder 39, HoF. “Aaron Greenberg: Knot Hole Gang member” in Tina Wright, ed. Cardinal Memories: Recollections from Baseball’s Greatest Fans (Columbia, MO: University of Missouri Press, 2000), 97. John Stanfill, “Letter to Dodger Fan,” undated, O’Malley Archive.